The beauty of a pond is something everyone can appreciate. A flash of golden fish swimming in clean, clear water beneath the pads of waterlilies is a sight to behold and enjoy. 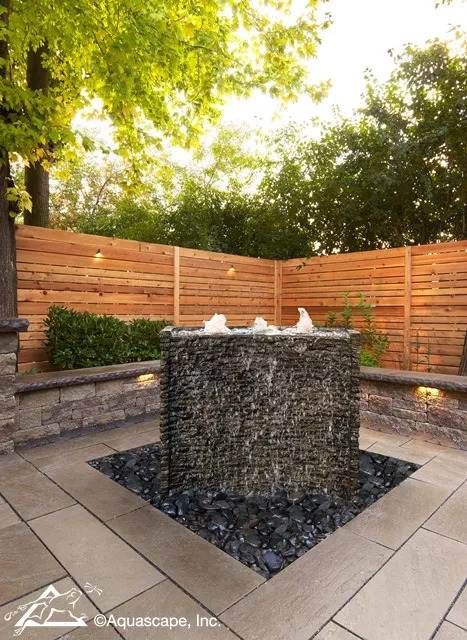 Add the sound of a running waterfall and you have a dream come true in your backyard. Keeping pond water clean and clear is the basis for a healthy pond that requires little to no maintenance. 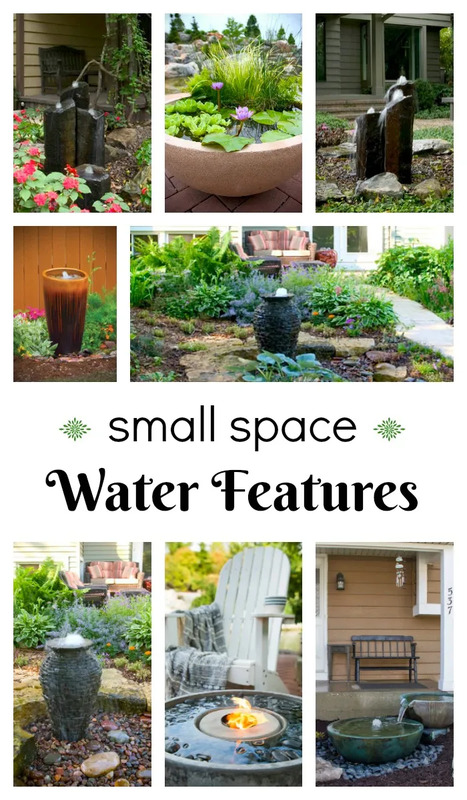 Fortunately, it’s relatively easy to create a proper pond environment that benefits your fish and plants. 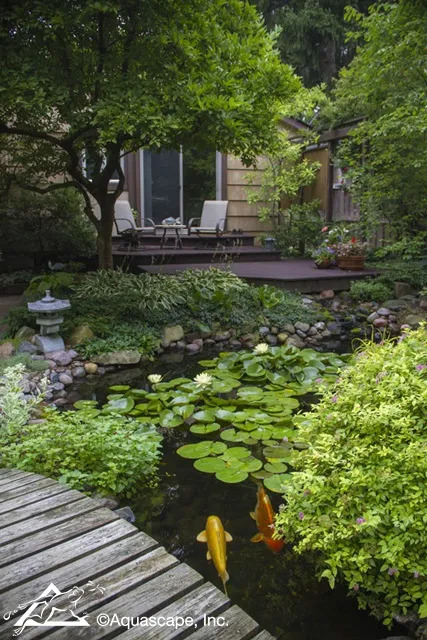 Follow our not-so-secret steps to ensure a naturally-balanced, low maintenance pond throughout the year! 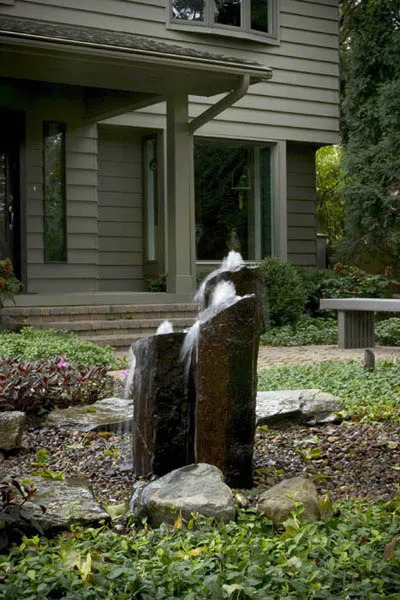 Circulation: Make sure your pond pump is the correct size for your pond and waterfall. A pump provides valuable aeration to the water. 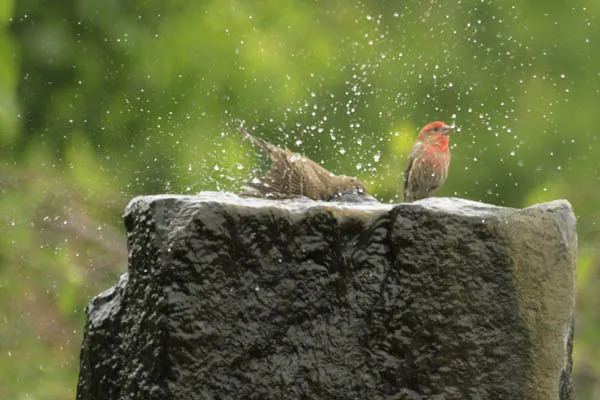 Several variables need to be considered when choosing a pump, such as the size of your pond and the height of your waterfall. Aquascape makes it easy to select the right size pump with our brand new Pond Pump Selection Guide. 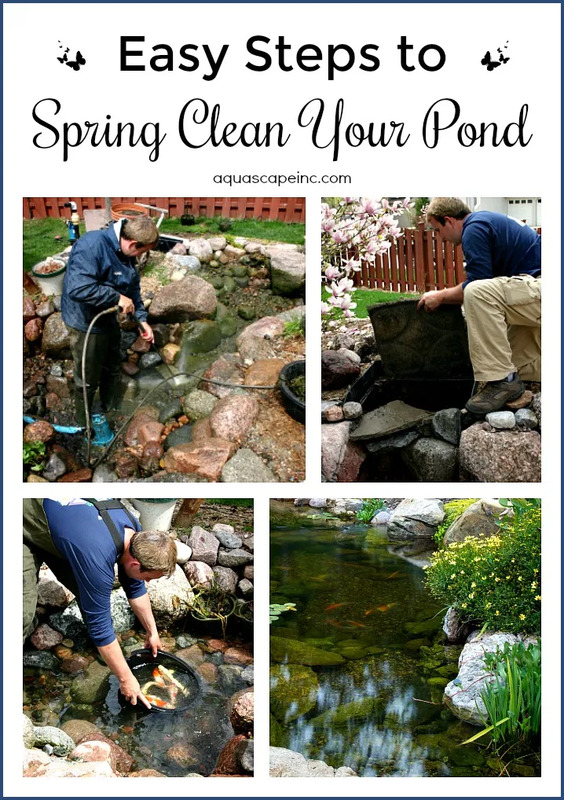 Filtration: More often than not, when answering questions about pond water quality, we find that people don’t have proper filtration installed on their pond. 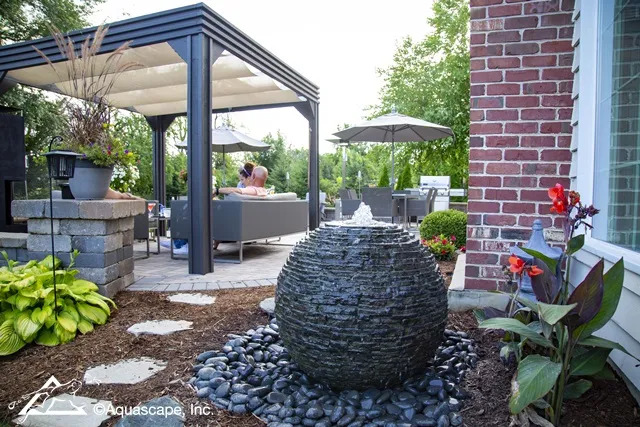 If you had your pond built by a Certified Aquascape Contractor, you should have no worries. But for others, you want to make sure your pond has both a biological filter and a mechanical skimmer. The biological filteris the start of your waterfall and adds beneficial bacteria to your pond. The mechanical skimmer is similar to a pool skimmer, removing surface debris such as leaves and sticks. 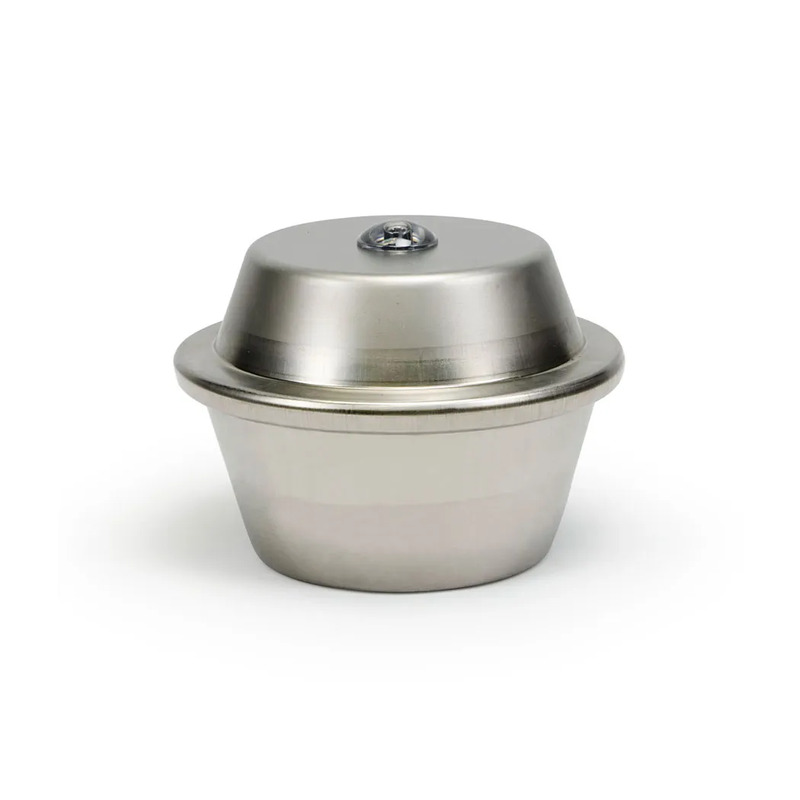 Ideally, you want to position the biological filter and skimmer at opposite ends of the pond. This ensures movement throughout the entire pond so you don’t end up with stagnant areas. For more information, download our e-book, How to Keep Pond Water Clean and Healthy. Rocks and Gravel: Ponds can be made various ways. Some are created with concrete, others with a simple pond liner. 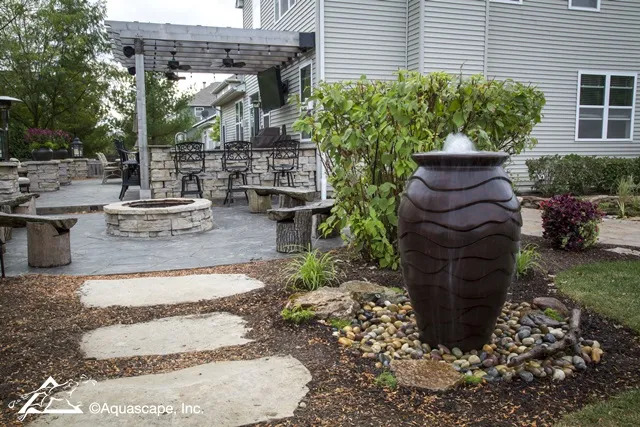 We believe in an ecosystem approach to the pondering lifestyle and use rocks and gravels in our ponds, after installing underlayment and liner. Gravel provides much-needed surface area for beneficial bacteria to grow. Your fish will graze on these bacteria, as well. The gravel won’t be a breeding ground for muck and debris if you ensure that your low maintenance pond has the proper pump and filtration. The ecosystem works together so it’s important not to eliminate any of the elements. 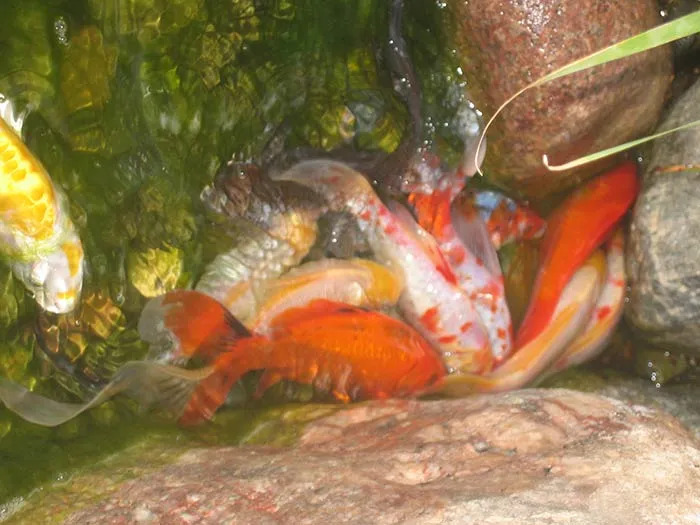 Fish: While fish keeping is fun, your finned friends play an important part in the overall ecosystem of your pond. They eat algae and their waste becomes fertilizer for your pond plants. Too many fish, however, can pose a problem. A good rule of thumb is to limit your fish load to no more than 10” of fish per 100 gallons of water. So if you have a 20 fish at various lengths totaling 300” when combined, then you need a 3,000 gallon pond. Plants: Plants play a critical role in the pond’s ecosystem due to their filtering capabilities. Plants absorb nutrients from fish waste and help starve algae of its food. 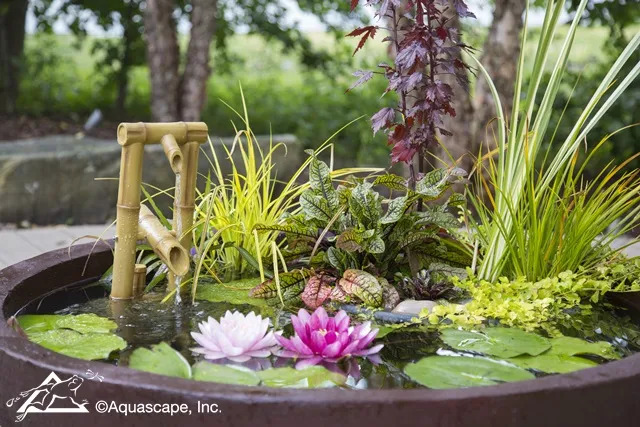 During hot summer months, make sure to have at least 40% of your pond’s surface covered with plants. 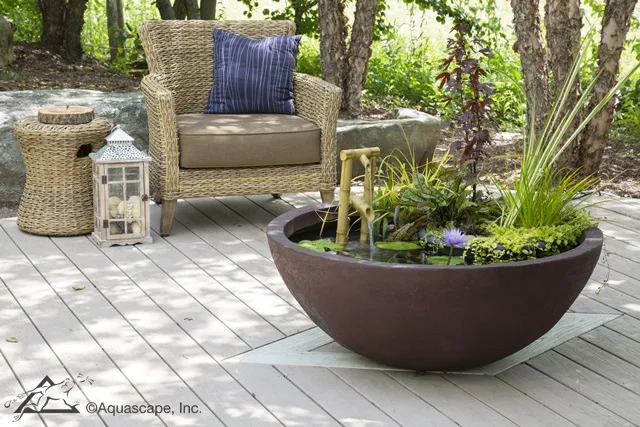 You can accomplish this with waterlilies and various marginals like mosaic plant, or floating plants like water lettuce and water hyacinth. And now you know the secret to a truly low maintenance pond. 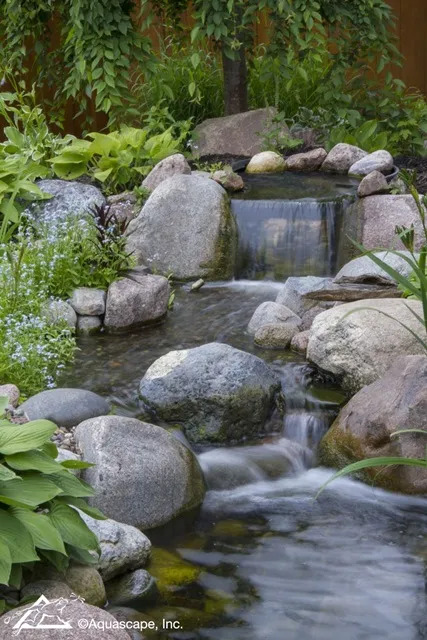 Start with the basics and create a naturally balanced pond with a combination of proper circulation, filtration, fish, plants, and rock and gravel. You’ll be amazed at how easy pond-keeping can be! It may be Winter but the party doesn’t stop for the Pontz boys. Check out our latest backyard koi pond build completed at the end of December. While it was mighty cold we pushed through and created another masterpiece. This winter pond build included installation of an Aquascape 8’x11′ ecosystem pond and removal of small existing pond . We also installed aquatic plants, and a fish cave. Due to the winter weather we are holding of on introducing the koi to their new home until the spring. The pond was finished off with a mulch bed around the perimeter and fine grading and seeding of damaged lawn from construction. 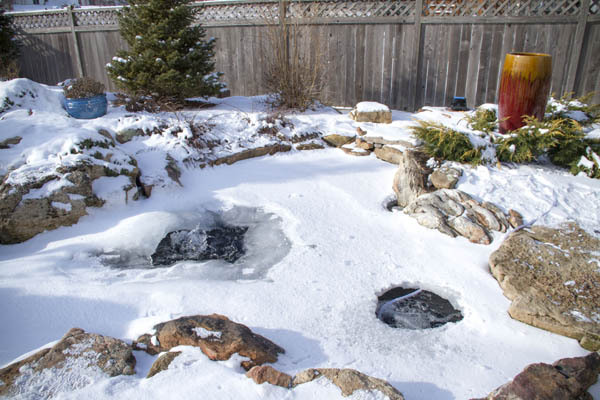 When the temperature starts to plummet, pond owners ask themselves how they can keep their pond running properly during the winter months. 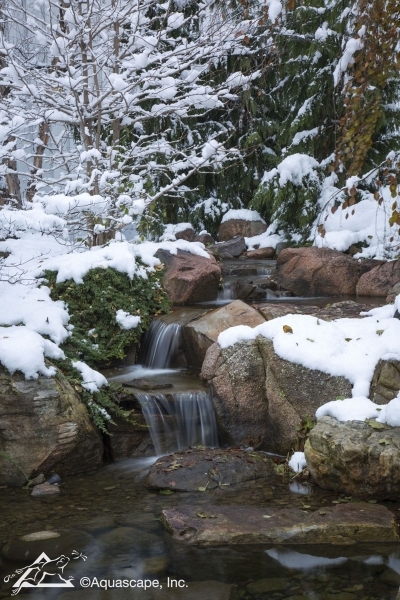 Follow our winter tips to keep your pond running optimally throughout the season. Keep a hole in the ice: Once the temperature starts to drop below freezing, you will notice the surface of your pond icing over. Your first instinct might be to rescue your fish before the pond freezes solid! No need to worry about your fish turning into ice cubes provided your pond is at least two feet deep. The fish will hibernate at the bottom of the pond where the water doesn’t freeze. 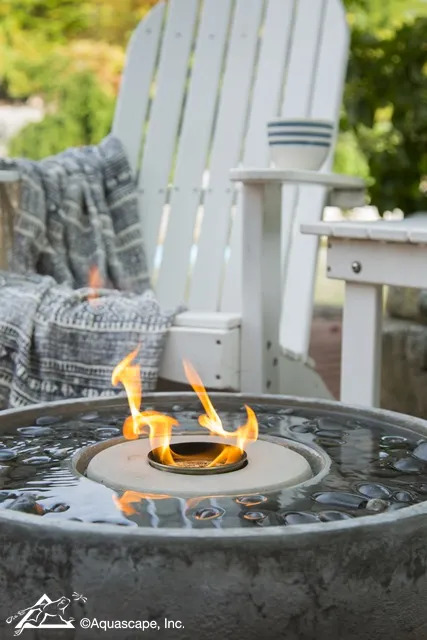 You do however, need to make sure that you keep a hole in the ice for the exchange of gases so the pond doesn’t become toxic to your finned friends. Don’t poke unnecessary holes in the ice: This hole in the ice is different from the aforementioned hole that’s necessary to keep your fish safe. In the winter you might notice ice build-up (especially around the waterfalls) that prevents your water flow from reaching the surface. Your first instinct might be to break off some of this ice which can create new holes. The ice formations on your pond act as a barrier between the cold air outside and the water running underneath it. Busting open the ice in multiple areas exposes the running water to freezing temperatures for a second time. Now all the newly exposed water begins to freeze and creates even more ice than before. 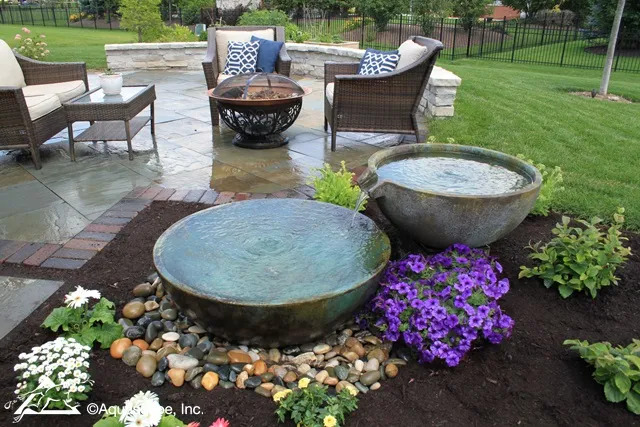 Consequentially, your water source will be depleted from this build-up of ice and you’ll find yourself having to top off your pond more frequently than you’d like. Breaking open other small holes in your pond is also ill-advised. 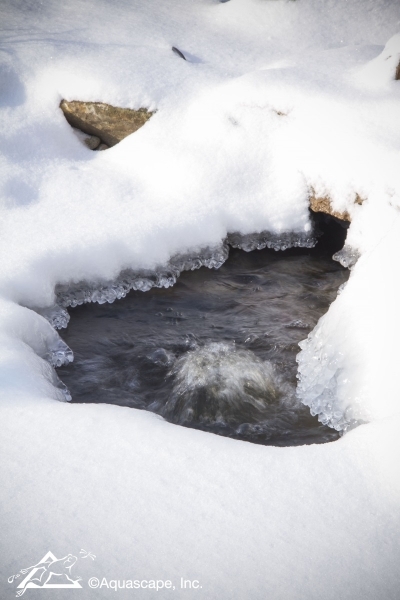 When you create a small hole across your pond, the water underneath will start to flow on top of the surrounding ice. This prevents your water source from running underneath the ice to reach your pump down below, and now your pond is leaking. To correct this, you need to carefully open another hole near your pump so all the water running on top of the ice will flow back into this new hole. Watch for water running over ice buildup: Sometimes you might notice that an area of ice has water running over it and out of the pond. This can happen near the waterfalls where water tends to splash and ice builds up creating a dam. Water coming over the falls might be diverted outside of the pond when this happens. To correct this, you need to carefully open a hole where the damming occurs so water runs freely over the falls and into the pond. A good way to eliminate a buildup of ice is to pour warmer water over it to melt the ice dam. It’s vital to keep a vigilant eye on an operational pond in freezing conditions. 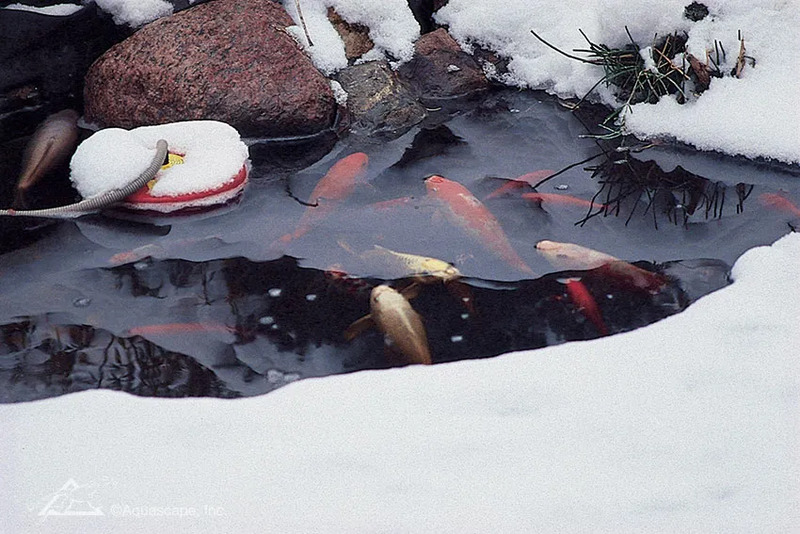 Although creating holes in the surface ice can cause problems, keep in mind you do need at least one good-sized hole for the exchange of gas and oxygen to keep your koi alive. You can use the AquaForce pump to accomplish this, or use the Pond De-Icer, or both. Creating this hole releases all the gases trapped under the ice, while also providing oxygen to your pond fish. Follow our winter pond-keeping tips and your fish will thank when spring rolls around! Is Your Pond Frozen??? If so you NEED this! The Aquascape 300-Watt Pond De-Icer is ideal for keeping a small hole in the ice during cold winter months, and ensures proper gas exchange, helping keep fish alive throughout the winter. Maintaining an opening in the surface of the ice is paramount for pond winterization and the safety of pond fish. 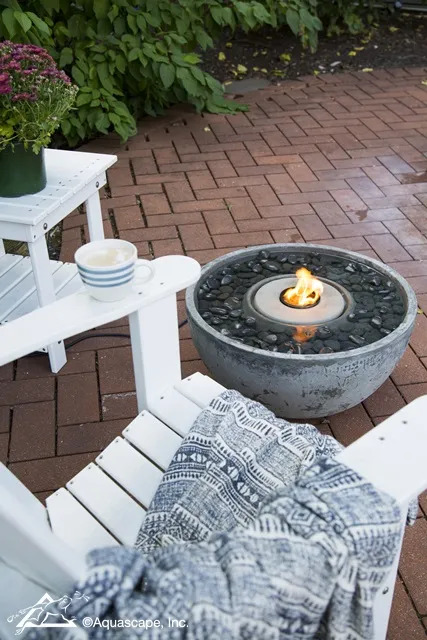 The Aquascape 300-watt Pond De-Icer is energy efficient and the stainless steel construction prevents corrosion and cracking throughout the year, providing years of trouble-free operation. A built-in LED light indicates when the De-Icer is in use, making it easy to verify functionality throughout the season. The 300-Watt Pond De-icer is backed by a 3-year warranty.